Not to be confused with pressure washer. Waterjet technology evolved in the post-war era as researchers around the world searched for new methods of efficient cutting systems. In 1956, Carl Johnson of Durox International in Luxembourg developed a method for cutting plastic shapes using a thin stream high-pressure waterjet, but those materials, like paper, were soft materials. In 1958, Billie Schwacha of North American Aviation developed a system using ultra-high-pressure liquid to cut hard materials. This system used a 100,000 psi (690 MPa) pump to deliver a hypersonic liquid jet that could cut high strength alloys such as PH15-7-MO stainless steel. Used as a honeycomb laminate on the Mach 3 North American XB-70 Valkyrie, this cutting method resulted in delaminating at high speed, requiring changes to the manufacturing process. While not effective for the XB-70 project, the concept was valid and further research continued to evolve waterjet cutting. In 1962, Philip Rice of Union Carbide explored using a pulsing waterjet at up to 50,000 psi (340 MPa) to cut metals, stone, and other materials. Research by S.J. Leach and G.L. Walker in the mid-1960s expanded on traditional coal waterjet cutting to determine ideal nozzle shape for high-pressure waterjet cutting of stone, and Norman Franz in the late 1960s focused on waterjet cutting of soft materials by dissolving long chain polymers in the water to improve the cohesiveness of the jet stream. In the early 1970s, the desire to improve the durability of the waterjet nozzle led Ray Chadwick, Michael Kurko, and Joseph Corriveau of the Bendix Corporation to come up with the idea of using corundum crystal to form a waterjet orifice, while Norman Franz expanded on this and created a waterjet nozzle with an orifice as small as 0.002 inches (0.051 mm) that operated at pressures up to 70,000 psi (480 MPa). John Olsen, along with George Hurlburt and Louis Kapcsandy at Flow Research (later Flow Industries), further improved the commercial potential of the waterjet by showing that treating the water beforehand could increase the operational life of the nozzle. High-pressure vessels and pumps became affordable and reliable with the advent of steam power. By the mid-1800s, steam locomotives were common and the first efficient steam-driven fire engine was operational. By the turn of the century, high-pressure reliability improved, with locomotive research leading to a sixfold increase in boiler pressure, some reaching 1,600 psi (11 MPa). Most high-pressure pumps at this time, though, operated around 500–800 psi (3.4–5.5 MPa). The first publications on the modern Abrasive Waterjets (AWJ) cutting were published by Dr. Mohamed Hashish in the 1982 BHR proceedings showing, for the first time, that waterjets with relatively small amounts of abrasives are capable of cutting hard materials such as steel and concrete. The March 1984 issue of the Mechanical Engineering magazine showed more details and materials cut with AWJ such as titanium, aluminum, glass, and stone. Dr. Mohamed Hashish, was awarded a patent on forming AWJ in 1987. Dr. Hashish, who also coined the new term Abrasive Waterjet (AWJ), and his team continued to develop and improve the AWJ technology and its hardware for many applications which is now in over 50 industries worldwide. A most critical development was creating a durable mixing tube that could withstand the power of the high-pressure AWJ, and it was Boride Products (now Kennametal) development of their ROCTEC line of ceramic tungsten carbide composite tubes that significantly increased the operational life of the AWJ nozzle. Current work on AWJ nozzles is on micro abrasive waterjet so cutting with jets smaller than 0.015 inches (0.38 mm) in diameter can be commercialized. Working with Ingersoll-Rand Waterjet Systems, Michael Dixon implemented the first production practical means of cutting titanium sheets—an abrasive waterjet system very similar to those in widespread use today. By January 1989, that system was being run 24 hours a day producing titanium parts for the B-1B largely at Rockwell's North American Aviation facility in Newark, Ohio. As waterjet cutting moved into traditional manufacturing shops, controlling the cutter reliably and accurately was essential. Early waterjet cutting systems adapted traditional systems such as mechanical pantographs and CNC systems based on John Parsons’ 1952 NC milling machine and running G-code. Challenges inherent to waterjet technology revealed the inadequacies of traditional G-Code, as accuracy depends on varying the speed of the nozzle as it approaches corners and details. Creating motion control systems to incorporate those variables became a major innovation for leading waterjet manufacturers in the early 1990s, with Dr John Olsen of OMAX Corporation developing systems to precisely position the waterjet nozzle while accurately specifying the speed at every point along the path, and also utilizing common PCs as a controller. The largest waterjet manufacturer, Flow International (a spinoff of Flow Industries), recognized the benefits of that system and licensed the OMAX software, with the result that the vast majority of waterjet cutting machines worldwide are simple to use, fast, and accurate. All waterjets follow the same principle of using high pressure water focused into a beam by a nozzle. Most machines accomplish this by first running the water through a high pressure pump. There are two types of pumps used to create this high pressure; an intensifier pump and a direct drive or crankshaft pump. A direct drive pump works much like a car engine, forcing water through high pressure tubing using plungers attached to a crankshaft. An intensifier pump creates pressure by using hydraulic oil to move a piston forcing the water through a tiny hole. The water then travels along the high pressure tubing to the nozzle of the waterjet. In the nozzle, the water is focused into a thin beam by a jewel orifice. This beam of water is ejected from the nozzle, cutting through the material by spraying it with the jet of speed on the order of Mach 3, around 2,500 ft/s (760 m/s). 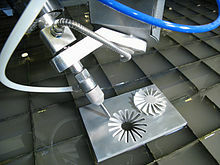 The process is the same for abrasive waterjets until the water reaches the nozzle. Here abrasives such as garnet and aluminium oxide, are fed into the nozzle via an abrasive inlet. The abrasive then mixes with the water in a mixing tube and is forced out the end at high pressure. Water jet cutters are also capable of producing intricate cuts in material. With specialized software and 3-D machining heads, complex shapes can be produced. The kerf, or width, of the cut can be adjusted by swapping parts in the nozzle, as well as changing the type and size of abrasive. Typical abrasive cuts have a kerf in the range of 0.04 to 0.05 in (1.0–1.3 mm), but can be as narrow as 0.02 inches (0.51 mm). Non-abrasive cuts are normally 0.007 to 0.013 in (0.18–0.33 mm), but can be as small as 0.003 inches (0.076 mm), which is approximately that of a human hair. These small jets can permit small details in a wide range of applications. Water jets are capable of attaining accuracy down to 0.005 inches (0.13 mm) and repeatability down to 0.001 inches (0.025 mm). Due to its relatively narrow kerf, water jet cutting can reduce the amount of scrap material produced, by allowing uncut parts to be nested more closely together than traditional cutting methods. Water jets use approximately 0.5 to 1 US gal (1.9–3.8 l) per minute (depending on the cutting head's orifice size), and the water can be recycled using a closed-loop system. Waste water usually is clean enough to filter and dispose of down a drain. The garnet abrasive is a non-toxic material that can be mostly recycled for repeated use; otherwise, it can usually be disposed in a landfill. Water jets also produce fewer airborne dust particles, smoke, fumes, and contaminants, reducing operator exposure to hazardous materials. Meatcutting using waterjet technology eliminates the risk of cross contamination since there is no contact medium (namely, a blade). Because the nature of the cutting stream can be easily modified the water jet can be used in nearly every industry; there are many different materials that the water jet can cut. Some of them have unique characteristics that require special attention when cutting. Materials commonly cut with a water jet include textiles, rubber, foam, plastics, leather, composites, stone, tile, glass, metals, food, paper and much more. "Most ceramics can also be cut on an abrasive water jet as long as the material is softer than the abrasive being used (between 7.5 and 8.5 on the Mohs scale)". Examples of materials that cannot be cut with a water jet are tempered glass and diamonds. Water jets are capable of cutting up to 6 in (150 mm) of metals and 18 in (460 mm) of most materials,, though in specialized coal mining applications, water jets are capable of cutting up to 100 ft (30 m) using a 1 in (25 mm) nozzle. Specially designed water jet cutters are commonly used to remove excess bitumen from road surfaces that have become the subject of binder flushing. Flushing is a natural occurrence caused during hot weather where the aggregate becomes level with the bituminous binder layer creating a hazardously smooth road surface during wet weather. Commercial water jet cutting systems are available from manufacturers all over the world, in a range of sizes, and with water pumps capable of a range of pressures. Typical water jet cutting machines have a working envelope as small as a few square feet, or up to hundreds of square feet. Ultra-high-pressure water pumps are available from as low as 40,000 psi (280 MPa) up to 100,000 psi (690 MPa). Uses a high velocity stream of Ultra High Pressure Water 30,000–90,000 psi (210–620 MPa) which is produced by a high pressure pump with possible abrasive particles suspended in the stream. Nozzles are typically made of sintered boride[which?] or composite tungsten carbide. Produces a taper of less than 1 degree on most cuts, which can be reduced or eliminated entirely by slowing down the cut process or tilting the jet. Distance of nozzle from workpiece affects the size of the kerf and the removal rate of material. Typical distance is .125 in (3.2 mm). Temperature is not as much of a factor. Edge quality for water jet cut parts is defined with the quality numbers Q1 through Q5. Lower numbers indicate rougher edge finish; higher numbers are smoother. For thin materials, the difference in cutting speed for Q1 could be as much as 3 times faster than the speed for Q5. For thicker materials, Q1 could be 6 times faster than Q5. For example, 4 inches (100 mm) thick aluminium Q5 would be 0.72 in/min (18 mm/min) and Q1 would be 4.2 in/min (110 mm/min), 5.8 times faster. By 1987, Ingersoll-Rand Waterjet Systems was offering a 5-axis pure-water waterjet cutting system called the Robotic Waterjet System. The system was an overhead gantry design, similar in overall size to the HS-1000. With recent advances in control and motion technology, 5-axis water jet cutting (abrasive and pure) has become a reality. Where the normal axes on a water jet are named Y (back/forth), X (left/right) and Z (up/down), a 5-axis system will typically add an A axis (angle from perpendicular) and C axis (rotation around the Z-axis). Depending on the cutting head, the maximum cutting angle for the A axis can be anywhere from 55, 60, or in some cases even 90 degrees from vertical. As such, 5-axis cutting opens up a wide range of applications that can be machined on a water jet cutting machine. 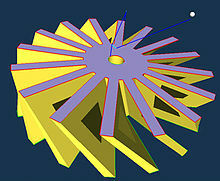 A 5-axis cutting head can be used to cut 4-axis parts, where the bottom surface geometries are shifted a certain amount to produce the appropriate angle and the Z-axis remains at one height. This can be useful for applications like weld preparation where a bevel angle needs to be cut on all sides of a part that will later be welded, or for taper compensation purposes where the kerf angle is transferred to the waste material – thus eliminating the taper commonly found on water jet-cut parts. A 5-axis head can cut parts where the Z-axis is also moving along with all the other axes. This full 5-axis cutting could be used for cutting contours on various surfaces of formed parts. Because of the angles that can be cut, part programs may need to have additional cuts to free the part from the sheet. Attempting to slide a complex part at a severe angle from a plate can be difficult without appropriate relief cuts. ^ About waterjets, archived from the original on 2010-02-14, retrieved 2010-02-13. ^ Fourness, Charles A et al, Paper Metering, Cutting, and Reeling Archived 2014-02-19 at the Wayback Machine, filed May 22, 1933, and issued July 2, 1935. ^ Johnson, Carl Olof, Method for Cutting Up Plastic and Semi-Plastic Masses Archived 2014-01-30 at the Wayback Machine, filed March 13, 1956, and issued April 14, 1959. ^ Schwacha, Billie G., Liquid Cutting of Hard Metals Archived 2014-01-30 at the Wayback Machine, filed October 13, 1958, and issued May 23, 1961. ^ Jenkins, Dennis R & Tony R Landis, Valkyrie: North American's Mach 3 Superbomber, Specialty Press, 2004, p. 108. ^ Rice, Phillip K., Process for Cutting and Working Solid Materials Archived 2014-01-31 at the Wayback Machine, filed October 26, 1962, and issued October 19, 1965. ^ Leach, S.J. and G.L. Walker, The Application of High Speed Liquid Jets to Cutting, Philosophical Transactions of the Royal Society of London Series A, Mathematical and Physical Sciences, Vol 260, No 1110, July 28, 1966, pp. 295–310. ^ Franz, Norman C., High Velocity Liquid Jet Archived 2014-01-31 at the Wayback Machine, filed May 31, 1968, and issued August 18, 1970. ^ Chadwick, Ray F Chadwick, Michael C Kurko, and Joseph A Corriveau, Nozzle for Producing Fluid Cutting Jet Archived 2014-01-31 at the Wayback Machine, filed March 1, 1971, and issued September 4, 1973. ^ Franz, Norman C., Very High Velocity Fluid Jet Nozzles and Methods of Making Same Archived 2014-01-31 at the Wayback Machine, filed July 16, 1971, and issued August 7, 1973. ^ Olsen, John H., George H. Hurlburt, and Louis E. Kapcsandy, Method for Making High Velocity Liquid Jet Archived 2014-01-31 at the Wayback Machine, filed June 21, 1976, and issued August 12, 1980. ^ "John Ericsson". British Made Steam Fire Engines. Archived from the original on 28 March 2012. Retrieved 10 June 2012. ^ Berry, Mitchell M., Piston Sealing Assembly Archived 2014-03-05 at the Wayback Machine, filed March 3, 1941, and issued March 23, 1943. ^ Templeton, Herbert W., Metering Valve Seal Archived 2014-03-05 at the Wayback Machine, filed July 11, 1958, and issued July 18, 1961. ^ Webb, Derrel D., High Pressure Packing Means Archived 2014-03-05 at the Wayback Machine, filed August 12, 1957, and issued October 17, 1961. ^ Hogan, John Paul and Robert L. Banks, Polymers and Production Thereof Archived 2015-07-27 at the Wayback Machine, filed March 26, 1956, and issued March 4, 1958. ^ "KMT McCartney Products for the LDPE Industry". KMT McCartney Products. Archived from the original on 24 December 2012. Retrieved 10 June 2012. ^ Olsen, John H., High Pressure Fluid Intensifier and Method Archived 2015-07-27 at the Wayback Machine, filed January 12, 1973, and issued May 21, 1974. ^ Olsen, John H., High Pressure Fluid Intensifier and Method Archived 2015-07-27 at the Wayback Machine, filed March 16, 1976, and issued June 14, 1977. ^ Smith, Elmo V., Liquid Blasting Archived 2014-02-27 at the Wayback Machine, filed June 10, 1935, and issued May 12, 1936. ^ Tirrell, Leslie L., Sandblast Device Archived 2014-02-27 at the Wayback Machine, filed April 3, 1937, and issued October 17, 1939. ^ a b Hashish, Mohamed, Michael Kirby and Yih-Ho Pao, Method and Apparatus for Forming a High Velocity Liquid Abrasive Jet Archived 2014-02-27 at the Wayback Machine, filed October 7, 1985, and issued March 10, 1987. ^ "ROCTEC Composite Carbide Abrasive Waterjet Nozzles" (PDF). Kennametal Boride Abrasive Flow Products. Archived (PDF) from the original on 6 December 2008. Retrieved 1 July 2012. ^ "Machining & CNC Manufacturing: A brief history". Worcester Polytechnic Institute. Archived from the original on 2004-08-20. Retrieved 25 June 2012. ^ Olsen, John H. "What Really Determines the Time to Make a Part?". Dr Olsen's Lab. Archived from the original on 6 May 2012. Retrieved 28 June 2012. ^ Olsen, John H., Motion Control for Quality in Jet Cutting Archived 2014-02-28 at the Wayback Machine, filed May 14, 1997, and issued April 6, 1999. ^ Olsen, John H., Motion Control with Precomputation Archived 2014-02-28 at the Wayback Machine, filed October 7, 1993, and issued April 16, 1996. ^ "SEC Form 8-K". Flow International Corporation. Archived from the original on 12 December 2013. Retrieved 1 July 2012. ^ "Crankshaft vs. Intensifier pump". WaterJets.org. Olsen Software LLC. Archived from the original on 6 August 2016. Retrieved 14 June 2016. ^ "Types of Pumps". www.wardjet.com. Archived from the original on 17 June 2016. Retrieved 14 June 2016. ^ "Basic Waterjet Principles". WaterJets.org. Olsen Software LLC. Archived from the original on 14 February 2010. Retrieved 14 June 2016. ^ "How Does a Waterjet Work?". OMAX Abrasive Waterjets. Archived from the original on 2 June 2016. Retrieved 14 June 2016. ^ "Waterjet Cutting Advantages". Archived from the original on 2017-09-21. ^ a b c d Lorincz, Waterjets: Evolving from Macro to Micro. ^ a b "Company". Jet Edge. Archived from the original on 2009-02-23. Retrieved 2009-06-11. ^ "What Materials Can a Waterjet Cut?". OMAX Abrasive Waterjets. Archived from the original on 2 June 2016. Retrieved 14 June 2016. ^ "Waterjet Cutting - Cut Metal, Stone, Paper, Composites". www.kmt-waterjet.com. Archived from the original on 2017-04-05. ^ WARDJet. "Waterjet University - Precision and Quality". WARDJet. Archived from the original on 2017-02-11. Retrieved 2017-02-10. ^ Olsen, John. "Improving waterjet cutting precision by eliminating taper". TheFabricator.com. FMA Communications. Archived from the original on 22 July 2015. Retrieved 18 July 2015. ^ "Waterjet Relationship Parameters". Archived from the original on 2010-09-09. Waterjet Cutting – How it Works, A look inside the physics of achieving high pressure water for waterjet cutting.